The commission, made up of four members of this body, will travel to Beni, to enter the TIPNIS and meet with the 64 indigenous communities that live there. 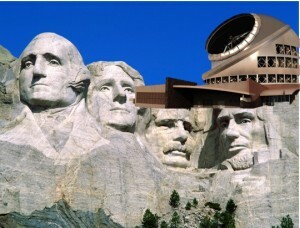 They also plan to meet with the colonizers, who are in Polygon 7. They have requested an audience with Mr. Evo Morales, President of Bolivia. 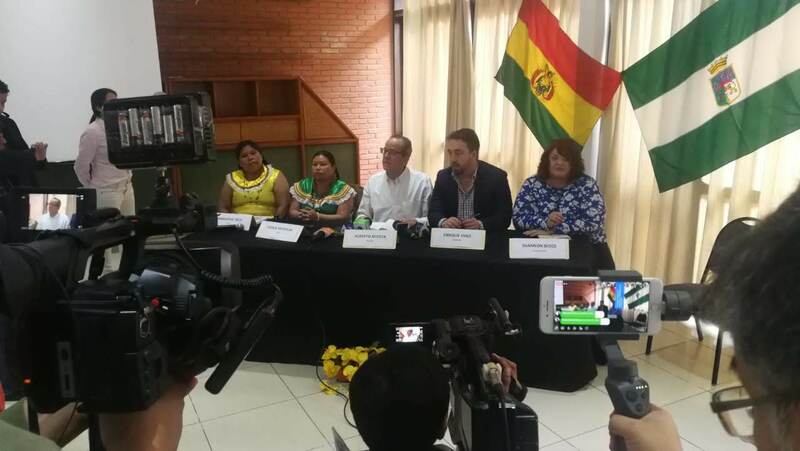 The International Rights of Nature Tribunal, has proposed to take advantage of the time they will have in Bolivia, which is scheduled from August 15th to the 23rd. The most important activities are related to the visit to TIPNIS and Polygon 7, as is the meeting requested with the Government. In addition to these events; the members of this court have been invited to participate in meetings with different pro-environmentalist institutions. Created in 2013 by the Global Alliance for the Rights of Nature, and also as a result of the II World Conference of Peoples on Climate Change and Defense of Life held in Tiquipaya, the International Rights of Nature Tribunal has become a world reference that deals with complaints about aggressions to which nature has been subject to. Although their verdicts are non-binding with any State, they manage to evidence and show actions that violate the Rights of Nature, becoming a moral authority that is highly respected in the international context. It is made up of academics and indigenous leaders who promote environmental initiatives. Among its functions, is to establish the causes and to determine who has been responsible for environmental violations, as well as to define the measures that must be taken to prevent these from happening again. In addition, it has the ability to define actions to restore the damage that has been caused. The arrival of the members of the Tribunal is scheduled for August 15th, 2018. One of its first activities will be the participation in a Conversation on the Rights of Nature in Radio Santa Cruz and then in a Forum on Nature and its rights in Bolivia, event which will be held that same day at the NUR University. Later, they will travel to the Beni where they will enter the TIPNIS to meet with the representatives of the affected communities, who denounced the violation of their rights and the attacks on Mother Nature. They plan a meeting with the colonizing leaders that make up the Indigenous Council of the South (Conisur), and later they will go to the government headquarters, to hold meetings which were requested by institutions and organizations that will present cases similar to the TIPNIS, where indigenous communities consider that nature is being threatened. 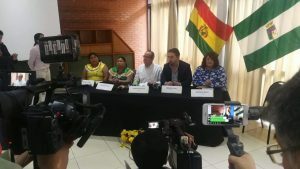 Although the government has not yet confirmed the meeting, on Wednesday, the 8th of August, the International Rights of Nature representatives, requested through the Bolivian Embassy in Ecuador, a hearing with President Evo Morales to know his position on the complaint raised by the indigenous communities around the TIPNIS. It had been suggested that the meeting be held between the 20th and 21st of this month. He is an Economist, who served as Minister of Energy and Mines during the first government of Rafael Correa and as president of the Constituent Assembly of his country, which recognized in its Magna Carta the Rights of Nature. He is a university professor and researcher at the Latin-American Institute of Social Research and at the Latin American Faculty of Social Sciences in his country. 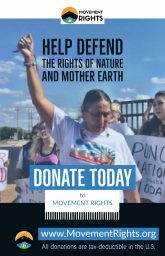 She is co-founder and Executive Director of Movement Rights, a North American institution that promotes the rights of communities, indigenous peoples and ecosystems. 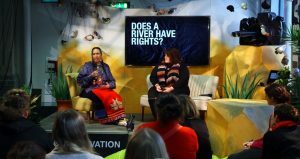 She is a recognized international leader for her work on support binding laws that recognize the rights of communities and nature over corporate projects. 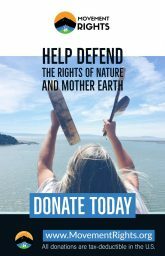 She is co-founder of the Global Alliance for the Rights of Nature and co-author of two books, one of them entitled “The Rights of Nature: Exposing the Universal Declaration on the Rights of Nature”. She holds a Master of Science degree from the London School of Economics. Lawyer trained at the University of Buenos Aires, where he studied a postgraduate degree, specializing in Environmental Law and where he also works as a teacher. He is founder of the Argentine Association of Environmental Lawyers. He is critical of the development model based on unlimited growth. He has coined the concept of ‘urban extractivism’ to refer to real estate speculation, which causes widespread environmental damage. He promoters of the Rights of Nature fervently. Mr. Viale has served as a litigant for environmental damage against companies such as Chevron, the real estate group IRSA, among others. He is a member of the Earth Law Alliance (Alliance for the Rights of the Earth), a network of specialized lawyers from around the world. The population registered as Mojeña in the 2012 Census (self-proclaimed), is comprised of 42,093 people. The Mojeña population is concentrated in three provinces: Mojos, Cercado and Marbán (in five municipalities); 50% of them live in the capital city of Trinidad and 9% in intermediate cities. The Mojeños are the main indigenous peoples of the Bolivian Amazon, both for prestige of their prehispanic river culture, as for their language, which has been used as a lingua franca during the Jesuit missions, prevailing over several minor ethnic groups. In addition, it is currently the ethnic group that has the largest population among the 24 existing throughout the Bolivian Amazon. The culture of Mojos is traditionally settled in the center and south of the department of Beni: geographically there are Mojeña populations from the sources of the river Mamoré, at the confluence of the Rio Grande with the same Mamoré and the lower course of the river Sécure to the south, right up until the Machupo river. There are Mojeños east of Mamoré and south of Trinidad; towards the west, going through San Ignacio de Moxos (TIM 1), practically the traditional center of Mojos; in the Multiethnic Indigenous Territory (TIM) and in the Indigenous Territory of the Isiboro Sécure National Park (TIPNIS). The provinces that correspond to the Mojeño region are: Cercado, Mojos, Marbán, Mamoré and Iténez and the main municipalities are Trinidad, San Ignacio de Moxos and San Javier. There are more than 70 stable communities and many temporary and precarious settlements, made up of various families. Among the important communities, there are the ones of: Pueblo Nuevo, Retiro, San Antonio del Pallar, Carmen del Aperecito, Monte Grande, Santa Rosa del Apere, Mercedes del Cabito, San Miguel del Apere, Puerto San Borja, Mercedes del Apere, Santa Rosa de Aguas Negras, San José del Cavitu, San Pablo del Cuverene, Santa Ana del Moseruna, Chinsi River, Chirisi River, San Salvador, Rosario del Tacuaral, San Ambrosio River, San Juan del Apere, Rosario, Trinidacito, Patrocinio, Bermeo, Nueva Brisa, Fátima, Limoquije. In the Tipnis, the communities that settle along the Isiboro rivers are: Sasama, Sécure, Ichoa, Chumimita, Chajmota, Plantota, Tayota, Lojojota, all of them with a Yuracaré presence. The TCOs in which the Mojeños have their communities: TIM (Multiethnic Indigenous Territory I, with mojeños, movimas and tsimanes); the TIMI (Mojeño Ignatian Indigenous Territory) and the Tipnis. The social organization of the current Mojeños is based on the nuclear family; although formerly, the composition of the extended family predominated. Communities are generally formed by 10 to 30 domestic units, although they can exceptionally group more families. Each community is governed by a Cabildo (which usually has a minimum of 12 members) and is the form of organization of the authority established by the Jesuits in all the missions. The Mojeña culture expands into an environment rich in biodiversity with valuable species of animals and plants. Approximately twenty animal species stand out for its meat for human consumption. There is an immense variety of birds and there are more than 350 fish species, about thirty of which are highly valued for human consumption. There are many species of fine woods such as “mara”, walnut, cedar, “palo maría”, “guayacán” and others such as “ochoó”, “curupaú”, laurel or “palo balsa”. There are great palms of motacú, totaí and jatata that are used in the construction of houses. There is also a huge variety of medicinal plants. The hunting, fishing and gathering activities are part of the Mojeña culture and are practiced on the banks of all the rivers, streams and lagoons (wherever possible), due to the permanent conflicts of the mojeños with loggers and ranchers because of the occupation of space and natural resources of its territory, as well as “surprise visits” and constant incursions of Colla colonizers. Mojeña communities are farmers and the work is carried out in single-family units. Each domestic unit does it in its own “chaco”, which does not exceed one hectare of land, occasionally two. The current native products are rice, corn, cassava, banana, sugar cane, beans, squash, sweet potato, citrus, coffee, cocoa, tobacco, which in some better organized and higher production sites are partially used for commercial purposes; as the production is, in general, of small scale and mainly destined for self-consumption, sometimes it is given in barter to river merchants (at increased prices, with respect to urban areas) with foreign products like matches, kerosene, sugar, used clothing, tools, 22-gauge rifle bullets or 16 mm shotguns and alcohol (whose traffic has increased a lot in recent years throughout the Amazon). Mojeños also produce wooden objects such as cart wheels or canoes for sale, drawers to grind grain or wash clothes, and other wooden utensils for various uses. They also manufacture pottery and ceramics (jars). For decades, the Mojos Artisan Center has been operating in Trinidad, where artisans make fabric made from vegetable fibers, hammocks in cotton thread, wood carvings, ceramics, musical instruments, hats, masks, toys and carpentry furniture, under an initiative of the Cabildo Indigenal de Trinidad and indigenous organizations, which have the support of international cooperation for its launch, and which is to be replicated in the communities, as there is already another similar center in the Cabildo of San Ignacio de Moxos. There is a gravel road from San Ignacio de Moxos – which is the road from La Paz and San Borja to Trinidad, which is interrupted every year by floods in the rainy season – and another paved road that reaches Trinidad from Santa Cruz de la Sierra, which is in very bad condition. Most the transportation between small cities and towns in the southern Amazon is by river, and secondarily by bridleways that can eventually be enabled for the entry of small motorized units. 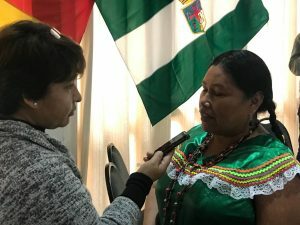 The communication between Mojeña peoples and communities and with other ethnic groups of the Amazon, is done through a network of radio transmitters, which connects the main nuclear communities around Mojos, and even the rest of the country. This means an extraordinary advance for the indigenous movement in a socio-economic situation, as severe as the one of the mojeños. Health services in the most remote indigenous communities are very precarious or simply non-existent. The sanitary posts, even if they are built, usually lack a health promoter that tends to them, and medicine is scarce. Towards the year 1880 the exploitation of rubber was introduced, which very soon carried with it entire populations, deconstructing the indigenous social and family groups and disarming also the worldview of a unitary society in the Mojeños. The fateful method of “hooking” and the forced recruitment of indigenous labor for transportation (as rowers) and as rubber tappers to the northwest, caused a deep depression in the life of the indigenous peoples of the central Amazon. This unleashed millenarian movements known as the “Guayocherías” or the search for the “Loma Santa” (with leaders such as Guayocho or José Santos Noco) who sought “the Land without Evil”, a political strategy that had a double effect: flee from oppression and recover freedom of the jungle and rebuild ties of social solidarity through the messianic religious community to resist the abuses of ranchers and rubber tappers. The millenarian movements (“in search of the Holy Hill”), although formed by small groups, have been reproducing every so often from the nineteenth century to the last third of the twentieth century addressing various places in the TIPNIS. Its origins are lost in time: the language – from the Arawak linguistic family and originating from a remote Caribbean – and the impressive archaeological remains that have been found (see Denevan, 1980, Lee, 1996, Jaimes and Prümers, 2015) of a culture that reached a high evolutionary level, that ceased mysteriously long before the arrival of the Spaniards. In 1675, father José Castillo, father Pedro Marbán and father Cipriano Barace entered Mojos from Santa Cruz. They stayed many years and founded the first Jesuit missions, beginning with Loreto in 1682 or 1684. After almost 150 years of exploration and curiosity, a Hispanic settlement was finally founded (Denevan, 1980: 63). The Jesuit missions in the central and southern Amazon had a hundred years of life and activity, until they left Mojos in 1767, following their expulsion from all of South America. The Jesuits founded 21 semi-permanent missions in Mojos, apart from the ones they also created in Chiquitos, Guarayos and Chapare. Compendium of indigenous ethnic groups and ecoregions of Bolivia Amazonia, Oriente and Chaco, Alvaro Díez Astete, 2018. Around 120 communities make up the Tsimane ethnic group with a population of 16,958 people who dominate the Tsimane language. The extensive area where they are located, has as center of its original habitat, the area of the foot of the sub-Andean mount, that becomes flattened in the province Ballivián, along the Maniqui river; and then extends to the provinces of Mojos and Yacuma. The highest density of the Tsimane population is found in the municipality of San Borja, followed by the municipalities of Rurrenabaque (Pilón Lajas), Mojos (Tipnis) and Santa Ana del Yacuma. Among the Tsimane communities, there are pseudo nomadic groups that do not exceed five families each. These are itinerant settlements that move seasonally to the highlands in the rainy season and to the low lands in the dry season. The change of residence can also be due to internal conflicts, death of relatives (according to their custom of burning the house of the deceased with all their belongings and going away), or because they move through their territory looking for sustenance based on hunting, fishing, harvesting and agriculture dedicated mainly to self-consumption. They have a deep feeling of belonging to the territory of their ancestors. The basic social organization is the nuclear family, which maintains extended kinship ties with other nuclear families. Marriage has been monogamous for a few decades (we believe that more for economic reasons, than acculturation), but the tendency to have a sort of polygamous marriage has not disappeared (this means that a man keeps two sisters as wives, raising all of their children together). Tsimane marriage takes place as soon as puberty has been reached; the first residence is settled in the house of the mother of the woman, but after a while the new family becomes independent. The extended family is so important for the Tsimane, that they symbolically and affectionately call each other “relatives”, even if they belong to extrapolated and contactless communities in their territory. The sociopolitical organization of the tsimane is sui generis. As it was not a hierarchically organized society in its ethnic past it did not have a leadership or “cacicazgo”. Until today, in the Tsimane settlements the chief (corregidor) is at the same time the political chief, usually the oldest man in the group, who by his experience is considered a Konsasiki or “Counselor”, in charge of ensuring good social relations. The group may or may not hear his advice. But in response to the secular abuses and the invasion of their territories by loggers and colonists, the tsimane organized themselves in a Western manner and for the first time in March 1989 they elected an ethnic political authority. Although the basic activities for the subsistence of the tsimane are carried out throughout the year (hunting, fishing, gathering, agriculture), a specific time where activities take place. Thus, the main activities in the era of the “surazos” are hunting and fishing with barbasco 134 and “atajados”. In the dry season, the chaqueo work is carried out: slash, tomb, chopping and burning of the forest destined to the plot that is going to be sown. In the rainy season, certain harvests are carried out, fishing and hunting (to a lesser degree), an activity that becomes very restricted in cases with a serious risk of provoking famines. Fishing is the basic activity for the feeding of the tsimane, considered as their most important activity. Fishing is done throughout the year, although the most intensive fishing season is during “cold weather” or winter. Fishing is practiced by men, women and children (these, even those of young age, are true experts in extracting sardines from the banks of the rivers using machetes); teens usually provide fish for the first meal of the day, thanks to their skill in using the bow and arrow. Economic activities of tsimane are increasingly concentrated in subsistence agriculture. There have been many species of diversified cultivation in two ways: 1) Family garden, located around the house – occupied by women, young people and children. 2) The Chaco, which is the space where a large part of the agricultural production is dedicated to self-consumption and some surplus for sale on the banks of the Maniqui River or in the town of San Borja. Each family is ‘owner’ of a plot of land (approximately 3,000 square meters) for their crops. Hunting is an activity mainly performed by men, although women can accompany the male, whenever she is not pregnant. If the hunt is done in one day, the man goes alone; if hunting is prolonged, he usually goes with relatives and siblings. Hunting complements the group’s dietary base. The breeding of domestic animals and the domestication of jungle animals is also a common practice among tsimane. The most common domestic animals are: dogs (for hunting), pigs, chickens, ducks (for food), monkeys, parrots, “maticos”, thrushes (for recreation and as pets of children and families). The tsimanes collect honey from wild bees, mountain fruits, “motacú”. Eggs of peta (turtle) are also collected, depending on the time of year, although not in the form and quantity that other ethnic groups. The extraction and sale of jatata, which is the palm leaf woven to build beautiful roofs of houses, is another source of income, since it is sold for substantial amounts in San Borja, when canoes are available to take it to merchants. The tsimanes also trade with timber forest resources, now under a management plan with the ABT. Unfortunately, the sale of its labor force has become a permanent resource of the tsimane to obtain subsistence goods: the loggers require the Tsimane labor force to open them “picadas” or paths to search for fine wood trees; the colonists hire them to make their “chaqueos”. The tsimane had already been designated and visited to be reduced to missions by the Jesuits since the seventeenth century, but since this intention was not materialized by the resistance of these natives to the reduction, they were subsequently made invisible as an ethnic people, to which they themselves contributed by retreating to remote areas of the jungle, as a strategy of protection against the Carayanas. In the 1980s they “revive” as protagonists, in light of the debates promoted by the Center for Research and Documentation for the Development of Beni (Ciddebeni) in 1986, among loggers, state officials and civil society, in regards to the legal status that the Bosque de Chimanes should have. It was then that the tsimane began to be recognized as an important indigenous Amazonian community that inhabited the land coveted by commercial loggers. As it was impossible to continue ignoring their social existence, several studies about them came up, with which they became one of the most conventionally known ethnic groups, although they continued to exist among the most politically ignored of the Amazon. This is a shamanic culture, whose gods are organized in a mesh of relationships similar to those of extended kinship, but recognizing certain hierarchical symbolic functions, for example, among the Lords of the Hills, the owners or masters of animals and the spirits of the dead. Poetry in the form of songs that has been recovered (see Riester, 1978 and Riester and Birk, 1993) expresses deep human feelings and intuition, and great creativity. As the scholars of this ethnic group have expressed, the spiritual conductor, the shaman who is still a spiritual itinerant leader among many communities, called Kukuitzi, also represents the authority in the groups, an authority referring to his privileged and a feared connection with the supernatural world of spirits, of the environment and the dead. The shaman is careful to ensure cultural identity, always attentively watching the intervention of foreigners in any action towards the tsimanes. The population is of 6,042 indigenous people and their language is the Yuracaré. The traditional habitat of the Yuracaré was very broad: the Isiboro River, joining the lower part of the Sécure River and the Ichilo River, in the Mamoré River springs, including the Chimoré and Chapare rivers (Cochabamba Beni, Santa Cruz). It also comprised the mountainous area of ​​the Cordillera de Mosetenes (La Paz) and the Bosque de Chimanes (province of Ballivián, Beni). In the 20th century, the Yuracaré also migrated northward to the lowlands of the Mojos province. With this old occupational base, at present, the Yuracaré share some land in the TCO of Tsimanes, in the Multiethnic Indigenous Territory (TIM), in the TCO Yuqui, and there are even settlements in the TCO Mosetenes (San Pedro de Cogotay and Covendo). The main territories of the Yuracaré are in the Tipnis, in the provinces of Mojos and Chapare, the TCO Yuracaré-Mojeño in the Ichilo province of Santa Cruz and the TCO Yuracaré in the Chapare and Carrasco provinces of Cochabamba. The Indigenous Territory of the Isiboro-Sécure National Park (Tipnis) was granted to the Yuracaré jointly with the indigenous Mojeño Trinitario and Tsimane, by Supreme Decree 22610 in 1990, with an executory title in 2009. In the Tipnis, live Yuracaré communities or families in the Isinuta, Isese, Moleto, Ichoa and Chipiriri rivers, settled in Puerto Aurora, San Jorgito, Santa Ana, Bolivar, San Pablo, Puerto San Francisco, Puerto Patiño, Sasama, Chimimita, Chajmita, Plantota, Tayota, Lojojota and others. Some of these points represent important multi-ethnic settlements. The environment and the natural resources of the Isiboro-Sécure have peculiar characteristics, being included between the last spurs of the Eastern Mountain range and the plains of Mojos and thus it includes two geographic zones: the one of foot of wooded mount and the one of the plains, but it is in the forests where the majority of Yuracaré society operates. In the year 2000 the Yuracaré finally achieved the certification of their ethnic demand of the TCO Yuracaré (although in permanent conflict with third parties). Currently there are 21 Yuracaré communities of the TCO titled. Among the main ones are: Boca del Chapare, Remanso, Limoncito, Santa Rosa, Nueva Cotoca, El Carmen, Barranquilla, Santa Ana, Nueva Esperanza, Trinidacito, Nueva Galilea, Misiones, Ibarecito, Puerto Cochabamba. The TCO is found between 167 and 234 meters above sea level, with an average temperature of 24 °C and has an annual rainfall of 2,513 mm. In this ethno-region there are two climatic periods: dry and rainy. The dry season begins in May and ends in October, while the rainy season extends from November to April. In the dry season the agricultural activities of chaqueo and sowing are carried out, and therefore there is an increase in the demand of manual labor. At the same time hunting and fishing activities are carried out (hunting is still done with bow and arrow, but in the areas adjacent to those of the colonizers, the Yuracaré already use “saloon” rifles and shotguns); in the rainy season, harvests such as rice, banana, bananas, chocolate, etc., take place. The fundamental food base of more than 90% of the Yuracaré families are the products of the traditional subsistence agriculture of the chacos (rice, corn, plantain, banana, cassava), complemented with products obtained from the forest and lately with the incorporation of citrus fruits, coffee, peanuts, beans, squash. The economic activities of the Yuracaré are diversifying in recent times, from their growing settlements as stable farmers, having introduced, for example, in the middle and lower areas, the collection of wild cocoa, a non-timber resource from which they benefit in the rainy season, when crops and banana plantations collapse due to floods: wild cocoa self-fertilizes. The income of the merchants to the TCO has greatly affected the food of the Yuracaré families, introducing groceries and merchandise with supplementary food and which substitutes a healthy diet. 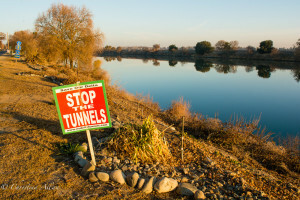 In addition, the habitat, flora and fauna are being intensely preyed upon, by timber businessmen, with whom there are agreements, and the colonizers, with whom they have conflicts. Social organization of the Yuracaré is basically through the ties of blood kinship and inbreeding alliance, constituting the nuclear family at the base of a network of relationships, which begins by grouping two to five of them in a settlement, which has or had self-sufficiency for the production and subsistence of the group. In the sphere of Yuracaré’s broader productive expectations, its main potential is the 60,000 hectares of forest for its use under a forest management plan for 20 years. Each year, the Forest and Land Authority (ABT) establishes an Annual Forest Operating Plan of 1,600 hectares. This area is distributed annually by zone, and consequently the distribution of economic benefits must be made among the families that inhabit each zone; the exploitation of 28% of the forest conglomerate is in a commercial category of fine woods. We must also highlight the existence in the territory of 22 natural lagoons, suitable for fish farming and the management of the yacaré lizard (Caiman yacaré) that provides leather and meat. Among the negative aspects, and important highlight is the fact that the Yuracaré have not been able to avoid the sale of their workforce. The poverty that leads to this situation has already shown the existence of relations of vile exploitation by timber entrepreneurs or colonizing owners through forced indebtedness. The first news is found in the relationship of the Dominican priest Tomás Chávez, from 1639. Father José del Castillo, in 1676, gives more extensive news about this group, which he found on the banks of the Yapacaní River. The region discovered then, which is the current TIPNIS, was the route sought by the Spanish missionaries to go to Mojos from Cochabamba and achieve direct communication with the Jesuit missions of the Mamoré river. According to Barragán (2000), the Yuracaré occupied the territories between Charcas and Santa Cruz at the end of the XVI century; Murillo Mendoza (2014: 70) states: “During the 17th century, Yuracaré and Chiriguano apparently have an alliance and attack together the Yungas-Mizque Doctrine.” According to these historians, the official documents of the time, show that in 1626, 1641 or 1648 there were serious complaints against the Yuracaré who, it was said, impeded the progress of communications between Cochabamba and Santa Cruz. In 1775, Father Marcos Menéndez, on the path that Bishop Herboso of Santa Cruz de la Sierra had opened seven years earlier, made the first peaceful contact with the Yuracaré “in the vicinity of the Chapare River, where there were one hundred and fifty Indians, who they received with joy “(Priewasser, cited by Murillo Mendoza, 2014: 51). Then followed the reduction of the population of Yuracarés in 1789 (San Carlos de Yapacaní), 1793 (San Francisco de Asís del Mamoré) – the missions of Buena Vista and Santa Rosa del Sara had already been founded- and in 1795 that of San Juan Bautista del Coni. From the nineteenth century several Franciscan missions were placed as heads for the Christianization of the Yuracaré: those of Mamoré, Chimoré, Coni, Vista Alegre, Concepción, San Carlos and Bibosi. From the second half of that century, began the republican colonization of the Chapare, forming several towns. Since then the Yuracaré had been pushed towards the most difficult parts of the jungle, in order to inhabit lands to the north. Several Yuracaré were used as pawns in the opening of roads, construction of bridges and as hunters-fishermen for the Quechua colonizers. With the foundation of Todos Santos, in 1920, this situation intensified. In the 1960’s, the missionaries tried to enter the villages, but without success, and the Yuracaré returned to isolate themselves in the forest until a few decades ago. 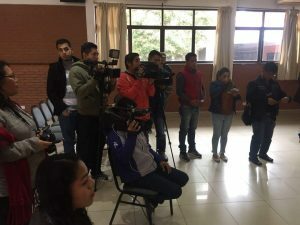 At present, the pressure of the Aymara and Quechua colonizers, as well as of the peasant unions of coca growers, seriously disrupt the life of the Yuracaré. They avoid contact and the consequent relations of unequal and asymmetric exchange imposed by the Collas (König, 1993). When the Popular Participation Law became effective, two Yuracaré indigenous municipal districts were established: one in the municipality of Villa Tunari, Chapare province, and another in the municipality of Puerto Villarroel, Carrasco province: some leaders consider that experience as a starting point to think about autonomic statutes. 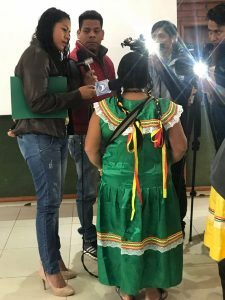 The Yuracaré became aware of the need to protect themselves from external threats and thus, they first joined the Subcentral of TIPNIS, the Chimanes Forest Sub-Center, the San Ignacio de Mojos Sub-Center (TIM) and the Cpemb. 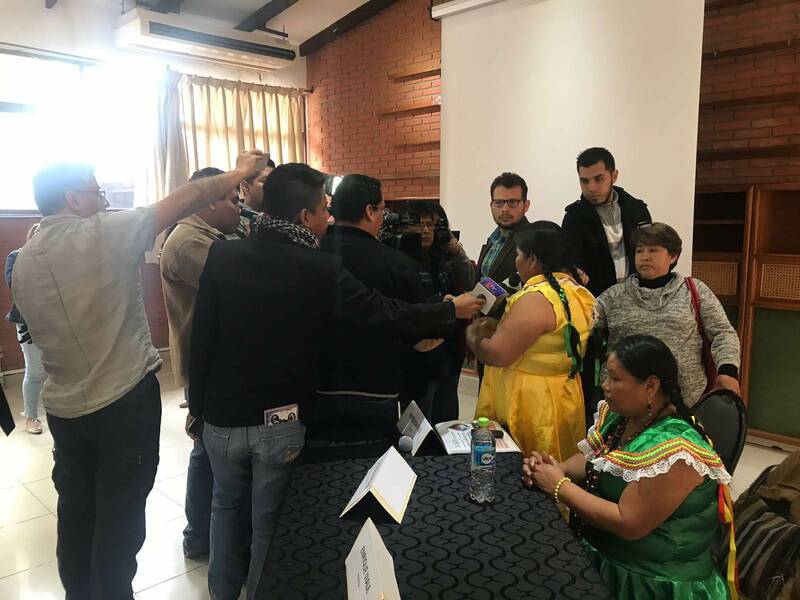 They formed the Indigenous Council of the Yuracaré People (Coniyura), which together with the Yuqui Indigenous Council, compose the Central of Indigenous Peoples of the Tropic of Cochabamba (Cpitco), a regional organization of the CIDOB. They are considered a Christianized indigenous community; it is also seen that they are self-sufficient in the way they organize themselves. Their real interest is the conservation of the mother tongue among the Yuracarés older than 30 years of age, their deep knowledge of the behavior of the rivers and the jungle, the environment and other factors of their ethnicity. The shaman (there are several among the Yuracaré) and the healers also have a certain degree of influence on the people, although not of decision. It is yet to be known how much the Yuracaré have lost in the last decades of their cosmogonic, mythological and cultural background, ancestral beliefs that organized their deep ethnic identity, and how they can recover from the systematic acculturation to which they have been subjected. The International Nature Rights Tribunal is inspired on and has as a fundamental document the Universal Declaration of Rights of Mother Earth approved at the World Peoples Conference on Climate Change and the Rights of Mother Earth held in Tiquipaya, Cochabamba, April 20-22, 2010. We proclaim this Universal Declaration of Rights of Mother Earth, and we call on the General Assembly of the United Nations to adopt it, as a common purpose for all the peoples and nations of the world, so that both individuals and institutions, are responsible for promoting through education, education, and awareness, respect for these rights recognized in this Declaration, and ensure through prompt and progressive national and international measures and mechanisms, their recognition and universal and effective application, between all the peoples and the States of the World. Mother Earth is a unique, indivisible and self-regulated community of interrelated beings that sustains, contains and reproduces all the beings that compose it. Each being is defined by their relationships as an integral part of Mother Earth. The inherent rights of Mother Earth are inalienable insofar as they derive from the same source of existence. Mother Earth and all the beings that compose it are holders of all the inherent rights recognized in this Declaration without distinction of any kind, such as between organic and inorganic beings, species, origin, use for human beings, or any other status. Just as human beings have human rights, all other beings on Mother Earth also have rights that are specific to their condition and appropriate for their role and function within the communities in which they exist. The rights of each being are limited by the rights of other beings, and any conflict between their rights must be resolved in a way that maintains the integrity, balance and health of Mother Earth. Right to a full and prompt restoration for violations of the rights recognized in this Declaration caused by human activities. Each being has the right to a place and to play its role in Mother Earth for its harmonious functioning. All beings have the right to well-being and to live free from torture or cruel treatment by human beings. 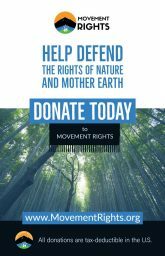 promote economic systems in harmony with Mother Earth and in accordance with the rights recognized in this Declaration. The term “being” includes ecosystems, natural communities, species and all other natural entities that exist as part of Mother Earth. Nothing in this Declaration may restrict the recognition of other inherent rights of all beings or of any particular being.